As spring slowly rolls into summer, the warmth of the sun’s rays bring the wild foods of our countryside into their full glory. In turn, most of our edible species become easier to identify, making this the perfect season for beginners. In the previous article we looked at the wild foods of spring and, importantly, the general picking rules, which should always be adhered to, for both your safety and the protection of our precious wildlife. This time, we will look at several easily identifiable species that are commonly found at this time of year. 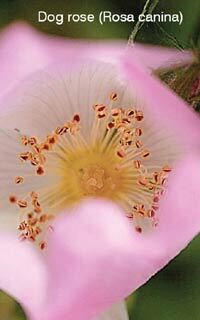 Dog rose (Rosa canina) is in flower during the months of June and July. Its pretty pink petals are one of the sights that many country lovers associate with a true British summer. This spectacular display does not last long, especially if there are strong winds, but the relatively short period of time has its advantages for the forager. Once the wind has gently carried its petals to the ground, it signifies to us the correct time for the collection of some of its remaining flowers – after all it would be a shame to harvest them while they are still in their prime. They have a delicate perfume that can add a subtle flavour to salads, or as a finishing touch to cakes. The red fruits, known as hips, were once gathered in vast volumes during the Second World War as they were highly valued for their vitamin C content. They are still used today in herbal teas and vitamin preparations. 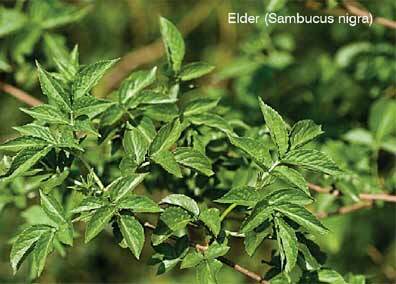 Elder (Sambucus nigra) is another very common sight. The leaves have a distinctive smell, which also aids identification. These must not be eaten, but its mist-looking, cream-coloured flowers are edible. Rid them of pollen beetles and other insects by simply tapping them off and setting them free – don’t wash the leaves otherwise you will lose the flavour! The flowers can be eaten raw, or even deep-fried in batter for a few moments and served sweet (with honey) or savoury (with salt). The berries are considered poisonous when raw, but the toxins are destroyed when cooked – try elderberry wine! The elder is home to further edibles that grow on it, such as Jews Ear(Auricularia auricula-judae), a strange-looking fungus that gets is name from Judas, who, it is said, hanged himself on an elder tree. The wood has a multitude of uses, which we will cover in another article. 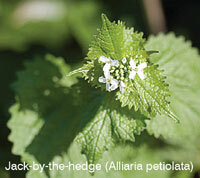 Jack-by-the-hedge (Alliaria petiolata) is an unassuming plant, often found by the sides of country paths and woodland margins. The crushed leaves give off the aroma of garlic, which has given rise to several common names such ashedge garlic and garlic mustard. They add a nice touch to sandwiches and the Sunday roast. A favourite way of enjoying this wild herb is to finely chop the leaves and add them to olive oil and serve as a simple dressing for salads and meats, and it works especially well with white fish. 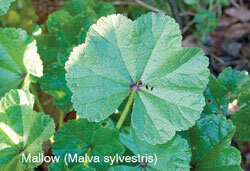 Mallow (Malva sylvestris), is a common plant of pathways and road verges, but may also be found growing around the edges of woodlands and meadows. The mauve flowers will be out between May and October and they are easy to spot. The leaves look as if they have been creased up and unravelled, due to the deep veins that run across them. These leaves are also rather stretchy when young and it is at this stage that they are best picked. The leaves are best used raw or added into a soup as a thickening agent. The flowers may be added to salads and the tiny seeds may also be nibbled on. However, avoid mallow if found growing around cultivated land as the leaves can contain a high concentration of nitrates. There are many different wild foods to be found in our countryside, and these are just a few examples of the common and easily identifiable species…. Happy foraging!